Getting your hair done is a big treat, and you expect to come out of the hairdresser feeling glamorous and like a million dollars. Unfortunately, sometimes it doesn't go according to plan, and you're not happy with the result. What are your rights when it comes to your 'do' and what can you do if it all goes horrible wrong? One very important thing with any chemical hair treatment is that you let the hairdresser carry out a patch test which involves putting a small amount of the dye somewhere unobtrusive (your elbow or behind your ear) before you have it put all over your head. We usually hear about reactions to home hair dye treatments but it's dangerous to assume that only home dyes can set off an allergic reaction. When you go to a new hairdresser for a colour or another treatment, don't be annoyed if they ask you to have a patch test before they will do it. If they don't, and you have an adverse reaction, you could potentially sue them for damages, depending on how serious the reaction is. Don't take any chances, it's only a quick test and will only delay your treatment for a day or so. Thankfully, allergic reactions to hair dye are very rare, and you should be OK to go ahead once you've had the patch test. Hairdressers aren't psychic, and the number one thing to remember when you're asking for a new 'do' is to be as specific as possible when you discuss what you want with the stylist. 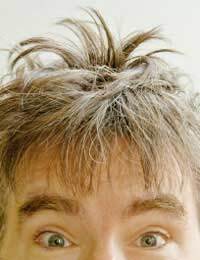 It's not in their interest to deliberately make a mess of your hair, so if there is a problem, it's often down to a misunderstanding rather than a deliberate attempt to make you look terrible. If you don't like what the hairdresser is doing - tell them! If you're not happy when they've finished, again, you need to tell them. Be polite, and reasonable, and explain why you're not happy. Most hairdressers will be mortified if you don't like their handiwork, and only too happy to try and sort something out. If it's the style, you might be able to salvage it, and if it's the colour you could ask them to try again, although it's not a great idea to keep chemically treating your hair. You need to take advice from the salon though. The problem with hair is that what you like and what the stylist thinks looks good is entirely subjective. Unless they do something really obvious like cut an uneven fringe or dye your hair bright orange instead of red, it's difficult to argue that they didn't style your hair with 'reasonable skill and care'. Negotiation is the way forward and telling the stylist that you're not happy, nicely, is the best thing. Shouting and screaming about how terrible the salon is won't get your hair sorted out. If the stylist has quite obviously done a terrible job, snipped your ear, dyed your hair a hideous colour or similar, but they won't do anything about it, you could use the Supply of Goods and Services Act to get compensation. You're only entitled to claim for actual financial loss, and in this case it would be the cost of getting your hair fixed by another salon. If you do go down this route, don't just go straight to another hairdresser before you speak to the stylist that messed your style up. If they refuse to rectify the mistakes (and it's reasonable to insist on a different stylist if you've lost confidence in the original one) you should tell them that you will be getting the job put right elsewhere and claiming the cost back. If you need to go to another salon, tell the new stylist what happened, and ask them to give you their comments - in writing if possible. Write to the original hairdresser with a copy of the receipt and any comments, and give them 14 days to reimburse you. I brought in a photo of the cut and color I wanted. It was a dark brown.She looked at the photo and after she washed out the color- my hsir was red with blond tips.She said she did an hombre and thought this color would look good. She wasn't able to fix it then because her flight to Jamaica was leaving in a few hours. She said I could come bsck in 2 weeks and she would redo and I could pay then. However this color is horrible.I am embarked to go to work or in public and havenoticed my scalp looks like there was also hair loss.What do I do?Do I pay her to fix it? .Do I tell her out of the 4 times I went there only 1 time she did what I wanted and request that they pay for me to go to a salon that has never failed me. (I only went to this girl because it as about $100 less). Thank you!! I had a perm yesterday, I had been for a consultation a few days prior and showed a picture of what I wanted (loose, beach waves) it’s my first perm so I don’t know the procedure. The stylist (who owns the salon) gave me poor service and was very distant. The end result wasn’t what I wanted but I thought I’d give it few days as I was told it would drop. I asked the stylist the procedure and what to do/and not to do. She said I could wash it the next day, never brush it and use a comb. I washed it today and it’s completely changed. It’s very uneven, some bits are even straight. I have now read that you are not supposed to wash it or get it wet for at least 3-5 days. It was raining when I left the salon and she didn’t say anything so it got wet straight away. I really don’t want to go back there but I’m £90 out of pocket and left with horrendous hair. What shall I do. I’m nervous about approaching them but I know they are in the wrong. Get someone else (another hairdresser) to give you an independent viewpoint to take back to the salon. Follow the advice in the article above. Hi I posted previously. What do I do if the hairdresser in question that caused the damage are refusing responsibility. I have had to visit my usual hairdressers who have written an email in confirmation of their finding. But I have had to have a considerable amount of hair cut out and off and still not sorted. I have full photo evidence and the hair as proof. As a consumer I have paid for a service and they have damaged my hair extensively not just the extra cost to try to correct but the huge distress this has caused ? Get a second opinion then if necessary claim for financial loss i.ethe cost of getting your hair fixed by another salon. Tell the new stylist what happened, and ask them to give you their comments - in writing if possible. Write to the original hairdresser with a copy of the receipt and any comments, and give them 14 days to reimburse you. Hi, I booked someone from Instagram to have balayage done, he owns a salon in central London. When I got to my appointment, I was met with his junior trainee colleague that was ‘assisting’ him but actually ended up doing the whole job. I refused to pay the price they quoted as I had booked with the stylist himself and not a junior trainee stylist, but they still charged me the same amount which was £350!! When I came home and had a proper look at my hair I noticed the colour was faded in some parts of my hair and was streaky at the back of my head which is not balayage, it’s actually highlights. I texted him straight away to ask if I could come in and have it fixed but he ignored my texts, I called and he ignored my calls also. It’s been a week and I cannot get through to him. This has left me out of pocket and have lost all my confidence. What are my rights please? If you're not satisfied with the service and the hairdresser is refusing to communicate with you, you may have to take further action via the courts. Send a letter to the salon address advising them of your issues and that they have not yet responded. Inform that that you are going to report the matter to Trading Standards and will seek to recover costs of repairing/redoing the hairstyle at another salon via the small claims court. Hi, just after Christmas I had hair extensions fitted, she didn’t give me a consultation just colour matched my hair by me sending her photos to go off (this was her idea not mine), this was the first time I’ve ever had them so didn’t know any different. I asked and paid for 22 inch, as she was fitting the hair she said that my natural hair is longer than she thought, as she was fitting them I thought it isn’t any longer than my natural hair (she knew I wanted them for extra length not thickness), when I got home I measured them and they were only just about 19 inch so sent her a message because I was obviously not happy. Her response was she was sorry but it was because she had cut them. She agreed she would replace the bottom row (I had 2 lines of extensions), with the longer length, when I got home again I realised that it looked far too thin only having the bottom row at a longer length, so I asked her to also replace the top row. But for this I had to pay extra, I wasn’t happy but I wanted them right. I have just been to another hairdresser for them re tightening, and she has told me they are a mess and need completely re fitting (that explains why they have been so uncomfortable), and also I have paid for a certain grade of hair, and that what she has used Is definitely not that grade of hair (she knows because she uses the brand/grade that I asked for). I was just wondering if you can advise me on where I stand, I want to have my money back so I can pay another extensionist to do it with the hair I’ve paid for. Is it something I can report to trading standards if she doesn’t agree to give me a full refund? This woman is also wanting to set up her own training academy which is very worrying! Your help would be really appreciated, I’ve saved up for this hair to have done for my wedding, have paid £400 and it’s just not right. If the extensions are not as described (e.g not the grade she said they were ) then you should ask the original hairdresser for verification of this.If she concedes that this is the case, then she should replace or refund you. If she refuses, you will need to consider the small claims court. Note, Trading Standards cannot pursue a case (for refund etc) on your behalf. The salon has offered a refund, if you paid in cash, they will have to refund in cash so you may need to go into the salon to get it. If you want to claim compensation you should get an expert (other professional colourist) to take a look at your hair and produce a short report for you, then take to the small claims court. Was this at a salon or by someone doing it privately? Please see the last section in the above article which explains what to do if your hairdresser is uncooperative following your complaint. We really can't comment/advise on individual cases like this. The Facebook post didn't specify a newly qualified stylist would do the colouring, but nor did it specify an experienced colourist would do it. Some colours do fade and require toning, especially the red shades but we can't really give advice on whether someone should know this beforehand on not - a good stylisthowever will usually make these things clear if you've not had a colour done before. You haven't mentioned whether you have given the salon the opportunity to rectify the colour in the few days after the appointment when you clearly weren't happy with the colour. It's unlikely the salon will refund you the entire amount if it's a misunderstanding over the particular shade. Hi,I went to a salon to get my hair bleached a few months back. The bleaching went fine, but the hairdresser told me I would need the ends cutting off, even though I told her I didn't want it cut. She cut the ends off, and it looked fine when I left.I had to go back to the salon a second time a week later for another bleach, as I was getting rid of my dark brown hair. This time, the hairdresser did the bleach, which was fine, and then she started cutting at my hair again, even though she never asked if I would like it cut, she just started doing it.It wasn't until I left the salon and got home that I realized what a state my hair had been left in.Before I first went to the salon, I had hair going down my back, the first time she cut it, it was okay, it was still quite long, now I am left with hair that is about 10cm long at the top, and above shoulder length at the bottom, and there are all different lengths in my hair, it's truly awful.It's really getting me down now, everyday I look in the mirror and hate my hair, I feel it would be better if I cut it all off and started again. I hate the way I look now, and it's starting to make me feel depressed.I don't know what to do anymore, it's now growing, my hair is wrecked.Is there anything I could do? You should really have said something when she started cutting it the second time. You could try and claim some kind of refund but it sounds more like a misunderstanding than anything. Is it a really bad cut or do you just not like it? Hi, I went to a salon to get my hair bleached a few months back. The bleaching went fine, but the hairdresser told me I would need the ends cutting off, even though I told her I didn't want it cut. She cut the ends off, and it looked fine when I left. I had to go back to the salon a second time a week later for another bleach, as I was getting rid of my dark brown hair. This time, the hairdresser did the bleach, which was fine, and then she started cutting at my hair again, even though she never asked if I would like it cut, she just started doing it. It wasn't until I left the salon and got home that I realized what a state my hair had been left in. Before I first went to the salon, I had hair going down my back, the first time she cut it, it was okay, it was still quite long, now I am left with hair that is about 10cm long at the top, and above shoulder length at the bottom, and there are all different lengths in my hair, it's truly awful. It's really getting me down now, everyday I look in the mirror and hate my hair, I feel it would be better if I cut it all off and started again. I hate the way I look now, and it's starting to make me feel depressed. I don't know what to do anymore, it's now growing, my hair is wrecked. Is there anything I could do? Firstly write to the hairdresser, tell them what's happened and say you would like compensation to cover the cost of (a) the original hair appointment (b) prescription charges (c) missed work (d) inconvenice/pain etc. See what they offer and whether you're happy with it.If they refuse or make an offer you're not happy with, consider mediation, seeking advice from a solicitor or making a claim through the small claims court. I paid £500 for a weave which I was told would be discrete and good quality. I had it installed on the provisions that I would definitely be able to tie my hair up with it. I have had it for 5 days and already hairs are sticking out the sides of the tapes and I cannot tie my hair up. Two people have pointed out the tracks to me already. Am I entitled to a refund? Thanks for your time.